Our Zwar ancestors came from the same area as Hochkirch and belonged to the next door parish of Gröditz. In this whole area there have been quite a number of families with these surnames in this area of Saxony. Some in Binnewitz, about 10 kilometres away emigrated to Texas. Exhaustive studies have found no connection to our Drehsa Zwar ancestors. Others lived in the neighbouring villages only a kilometre or two from Drehsa, but we have found no connections in the past 300 years to these families. This doesn’t mean there has never been any connection at all along the ancestral line, but there are no obvious ones in the past 300 years. How could there be so many varieties of one surname? We live in the age of phone books and government records like Births, Deaths and Marriages, and Taxation Files and more. It is difficult for us to understand that none of these government records existed several hundred years ago. There were no typewriters or computers. The churches kept hand written records, but not the government. When a couple went to get married, or brought a child for baptism, or a member of the family died, the pastor would enter the record and spell the surname the way it sounded to him, particularly if the folk couldn’t read or write themselves. If the Pastor was Wendish or in a Wendish district he would likely write ‘Swore’, or ‘Sware’, or ‘Swora’ or ‘Swor’ or something similar for our ancestors. If he was a German pastor he might enter ‘Zwore’ or ‘Zwahr’ or ‘Zwar’ or something similar. There was no single ‘right’ surname. It is accurate to say they are all ‘correct’! They are all for the same families. The modern idea of the Government keeping birth, death and marriage records of each person was a new idea that came with the ideals of the French Revolution. Some people hated the idea. When Napoleon’s armies wandered through European countries the soldiers had jobs allotted to them in the months between battles. Some soldiers were sent house to house to take a census and record the names of the people, including a surname. For example, in Holland today there are leading families who have crude and rude surnames. When the French soldiers had called at their homes and asked about a surname the Dutch peasants who hated this intrusion by the enemy, looked at the chickens in the back yard and gave their surname as “Chookshit”! or some other rude and derogatory name. I am sure some of the Wends and Germans did the same. When Napoleon was defeated and driven out of German countries the German rulers abandoned the government keeping of family records because the practice was associated with their hated enemy. After some years there were German rulers who decided it might be a good idea after all to have records of all of their subjects, and re-introduced the practice of keeping Birth, Death and Marriage records for everyone. When a large number of German countries formed a coalition in 1870 and this new Country became the modern Germany we know, the different German States introduced the keeping of records on everyone. If one goes back to Germany today and looks for government records on one’s ancestors, one will find that these records only began about mid 1870’s. Many of our ancestors were already in Australia by then. The different German governments in the past had issued ‘workbooks’ to apprentices, and passports to those allowed to go overseas [eg. not allowed were males who had not served in the army for two years], but no records of Births, Deaths and Marriages were recorded in the years before 1870 unless you were a wealthy ruler with a title in front of your name. The surname of Peter ‘Swore’ as recorded for his baptism in the Gröditz Church records 1755. In Australia Peter signed his name in 1872 in the front of a devotion book as ‘Pitter Swara’. This is the only time I have seen a Wendish form of the surname written in Australia. In German countries they had to use German surnames for official government business. When they travelled to Australia they kept using the German form on official papers including their passports. When Peter put his name in the front of his devotion book in Australia he wrote it in Wendish. Peter Zwar signs his name ‘Pitter Swara” in the front of a devotion book. “I’m glad to have had the opportunity of seeing this. You are undoubtedly right in saying that this is in Wendish. In the 1728 Bible the Christian name is written Pjeter (nowadays written Pětr). From the beginning of Wendish writing (16th cent.) the vowel ě caused difficulty. It is slightly diphthongal (i + e) and has no German equivalent. The use of the Czech letter ě was first adopted around 1842, though the sound of the Czech vowel is different. Anyone literate in German might well convey the sound of Pětr as Pitter.
. . . GERALD STONE FBA is emeritus Fellow of Hertford College, Oxford, U K. He is the author of numerous books and articles on aspects of the language and culture of the Wends, Sorbs and Kashubs, including an upper Sorbian-English Dictionary. Below are examples of ‘Sswore’ as it was printed in the Wendish Newspaper ’Tydsenske Nowiny’ in 1852, when the Wendish Newspaper published Michael Zwar’s first letter home from Australia. According to the dictionary the Wendish word ‘ swora’ is a ‘Tie,’ a ‘Bond’ or a ‘Link’ : eg. A strip of leather used to hold the two wooden parts of a flail together. In the polish language, also a Slavic language and closely related to Wendish, the word ‘zwar’ is used for the leather tie holding the two wooden parts of the flail together. The Wends with the surname Swore lived in the Kingdom of Saxony. German was the official language of the Kingdom just as English is the official language in Australia. All places in Saxony were given a German name. So even today when one drives into a village, town or city in the Wendish areas there are two names displayed—both the Wendish and the German. The street names are given in both languages. In Australia one can sometimes see the ancient aboriginal name displayed as well as the English name. eg. ‘Uluru’ is the indigenous name, and Ayers Rock is the English form. In the Kingdom of Saxony everyone had to have a German surname for official and legal use. Sometimes the German form had no relation to the Wendish form, just as the English name ‘Ayers Rock’ has no connection to the indigenous meaning of the name ‘Uluru’. The German form of the Wendish surname ‘Swore’ was usually Zwahr, or Zwar. In Germany both forms are still used today, sometimes within the same branch of a family. The descendants of the Wendish ’Swore’ family from Drehsa who remained in Germany seem to have always spelt the surname as Zwahr down to the present time. The International Genealogical Index of the Church of Jesus Christ of Latter-day Saints lists a Peter Zwor who was born in Binnewitz near Bautzen in Saxony on 28.9.1788. His father’s name is given as ‘Johann Peter Swora’. It is a good example of the father using the Wendish form of the name and the son a German form. When the Wend Peter Swore migrated to Australia in 1854 his name is given at the top of the official Saxon passport as ‘Peter Zwar’, but at the bottom of the same page he signs his name as ‘Peter Zwahr’. Although on his passport (1854) Peter signs his name in the old German script as ‘Peter Zwahr’, the name on his birth certificate, issued in 1844 (20 years after his birth) is ‘Zwar’. 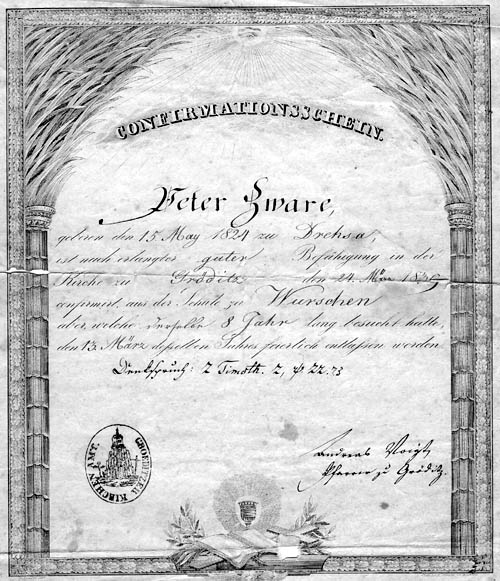 Note the spelling on Peter’s confirmation certificate (1839). (The ‘e’ at the end could be the influence of the Wendish ‘Sswore’ and/or ‘Sswory’) The spelling probably depended on the Pastor who recorded the event in the Church records. The German word ‘zwar’ can mean ‘indeed’, ‘certainly’, ‘to be sure’, ‘of course’, ‘truly’. The word ‘zwar’ is usually used in German to add emphasis to a point. ‘He is certainly an old man’; or ‘He is an old man, that’s for sure’. The form Zwahr is not a German word; but the ‘h’ is presumably a Wendish influence on the German word. In German the word ‘zwar’ is pronounced ‘tsvar’ to rhyme with the English word ‘car’. (The ‘z’ has a sharp sound as in ‘tsar’). The official German word ‘zwar’ has usually been the written form used in Australia, but from the beginning the Wendish pronunciation of Swor has been in everyday use. So the German word ‘zwar’ is used, but pronounced in Australia as the Wendish ‘Swor’. In Australia Zwar was pronounced ‘Swor’, to rhyme with war, (and not the German pronunciation ‘tsvar’ to rhyme with ‘car’). This has been true for all three brothers who emigrated to Australia. Their descendants originating from Broadford in Victoria, the Barossa Valley and the mid north of South Australia usually pronounced Zwar as Swor. When descendants attended a Lutheran College where most of the teachers were of German background, the teachers always pronounced it as the German form ‘tsvar’ whether one liked it or not! (One did not correct ones teachers!). If one went on from a Lutheran College to a Lutheran Seminary the German pronunciation ‘tsvar’ continued well into adulthood, whether one preferred it or not. and Zwar pronounced ‘Swar’ to rhyme with ‘car’. Australians pronounce the ‘z’ as a soft form of the ‘s’, and not the sharp ‘ts’ of the German language. When Peter Zwar’s son Ernst moved from South Australia to Western Australia (in the late 1800’s) he changed his name to Swar. One still finds this spelling in Western Australia. I have information on other Zwar families worldwide and I hope to share some of this information on this website. I would welcome hearing from other Zwar / Zwahr families throughout the world. In 2011 I received an email from Slovenia which said, “My name is Andrej CVAR and my family is living in Slovenia since 18 century (at least). From church books I found that our family name changed sometime between 1850-1860 from Zwar to Cvar. In the USA there have been generations of Swor families who can be traced back to John Swor, who had emigrated to Philadelphia from Binnewitz in the Bautzen District of Germany in 1843. John Swor’s father was Karl Zwahr of Binnewitz. There are also other Zwahr families in the USA, and Zwar families in Canada. As later research has shown, ‘zwar’ is not from Stazowar but is the German form of the Wendish ‘Swore’. Unfortunately, in a publication some years after Burger’s article, this material was used but Burger’s careful statement (“If derived from Stazowar”) is left out and it is blandly stated that zwar means a “military guard”. This statement is false. Unfortunately there are now people in Australia who have been misled and believe ’Zwar’ means a ‘military guard’ and it is now difficult to correct the error. Once published, false information continues to be read by innocent readers as though it were a fact.